Henna paste is all natural containing only the powder of crushed henna leaves, eucalyptus oil, and lemon juice for scent. Express yourself without the commitment. NO CHEMICALS ARE ADDED.. The Henna paste is applied to the skin in a freehand drawing. After drying in 15 to 20 minutes henna past crackles, flakes and falls off leaving your tattoo on your skin. Let the dried paste fall off on it's own. Henna paste is a dye and the longer it is left on the skin, the more layers of skin become stained by it. The design will darken over the first 24 hours to its natural reddish brown color. Reacting with the pigments in various skin types, it will turn more brown on lighter skin and more red on darker skin. The tattoo will remain until all the stained layers of skin naturally exfoliate. 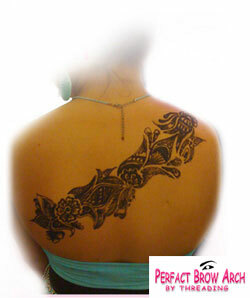 It will last from 2 to 4 weeks making Henna Tattoos the longest form of temporary tattoos available. "Jagua" is an edible, orange-size, tropical fruit with a thick rind found in the Amazon. The natural dye is extracted from the unripe fruit and used for many purposes by indigenous people throughout Central and South America, especially for body adornment. 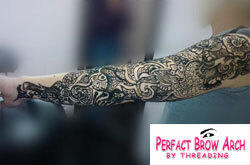 Jagua is a great way to try out tattoo ideas as it looks just like a real tattoo. - magical, takes 12-24 hours for the color to appear. - Lasts 10-15 days on the skin, then disappears completely.